Think filing your taxes is a pain? Imagine doing it in macramé! It may sound far-fetched but that’s exactly how the ancient Incas kept records. With colored, knotted strings called khipu. Colonial documents verify that khipu were used in Inca accounting. They look like the icicle lights people put on their houses: one main string, with smaller strings of varying lengths hanging off. Instead of lights, there are knots. The sequence of colors and spacing have specific meanings, as do the knots. For example, figure-eight knots mean the number 1. 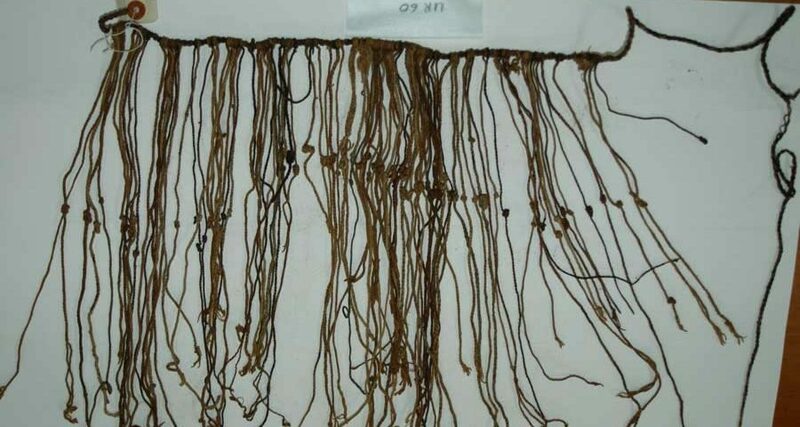 Harvard researchers Gary Urton and Carrie Brezine analyzed seven khipu found bundled together. They discovered a hierarchy: The values of lower-level khipu are summed up in higher-level khipu. The top khipu in the bundle tells you the value of the whole thing. The strings were used to send orders and reports all over the vast Inca empire. It’s what they used, instead of writing. So now you know how the Incas kept count. It’s not just some yarn! Or is it?